Of all the Sandals beach resorts, it has been said that perhaps Sandals Halcyon Beach best defines the Caribbean–set on a palette of lush gardens bordering the tranquil Caribbean Sea. By design, this all-inclusive St. Lucia beach resort is built naturally into the environment with no building higher than the highest palm. Classic Caribbean architecture and quaint, charming ginger breaded cottages are creatively designed to meld into the luxuriant surrounding landscape. Lazy swims in the secluded lagoon pool (one of three), seductive strolls among birds of paradise and brilliantly shaded trees, and an unwavering sense of “No worries, Mon” brings your fantasy island to life. A highlight of every St. Lucia vacation is indulging in the island’s most impressive dining experience at The Pier—dramatically extending 130 feet out over the water. It’s just one of four restaurants and seven bars, plus with our dine around program there are seventeen additional restaurants at the neighboring Sandals St. Lucia Resorts. With a spellbinding backdrop of verdant mountainsides reminiscent of exotic Fiji, your senses awaken. This is quintessential Caribbean, and you are about to surrender to a world of enchantment and the ultimate island state of mind. 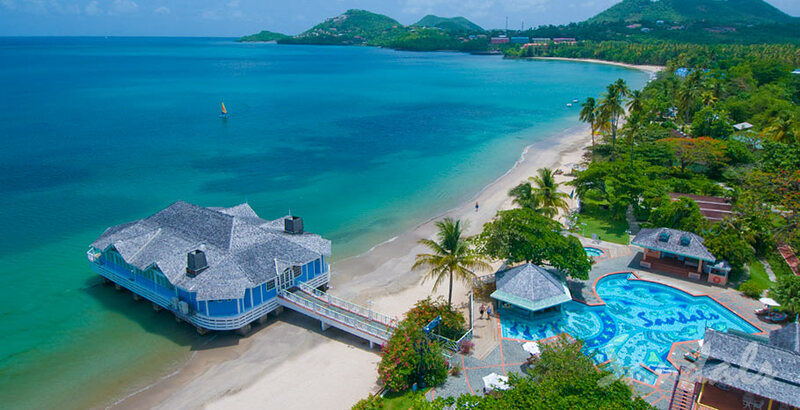 Learn more about Sandals Halcyon Beach in St. Lucia.